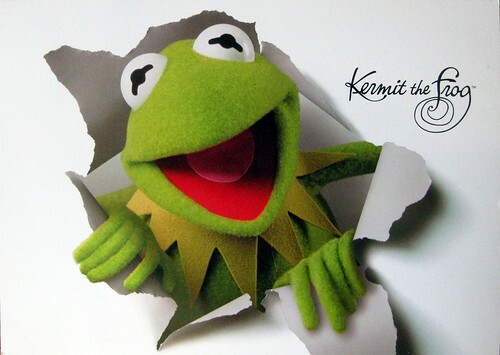 I had the good fortune recently to get a Postcrossing address from someone else who loved the Muppets, especially Kermit the Frog. So I sent her this postcard. It came from the U.S. Postal service, from a set of postcards to match the Jim Henson/Muppets commemorative stamps. 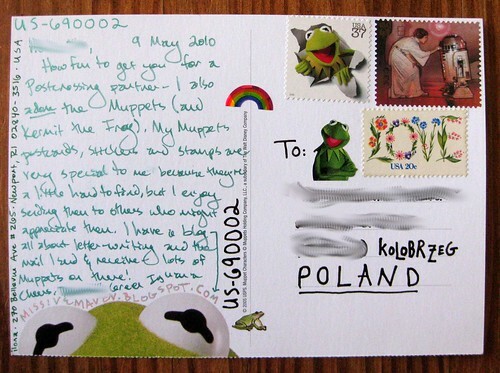 Of course I had to incorporate the matching 37-cent Kermit stamp into the postage to Poland. okay I want one of those have a thing for the muppets too as well as the beatles . That is freaking awesome. I really am disappointed in the postal service's latest stamps - I think I need to make a journey over to ebay for some new ones. that postcard is so cute..i love how you can see kermit peeking at the bottom. Love cards like this, unusual & fun stuff! No doubt the recipient will love it, too. Oh, and that's a cool ID number you got.